Guests staying at Miller House are invited to retreat from their busy lives to relax in the luxury of the Kaipo suite at this elegant, historic farmhouse. 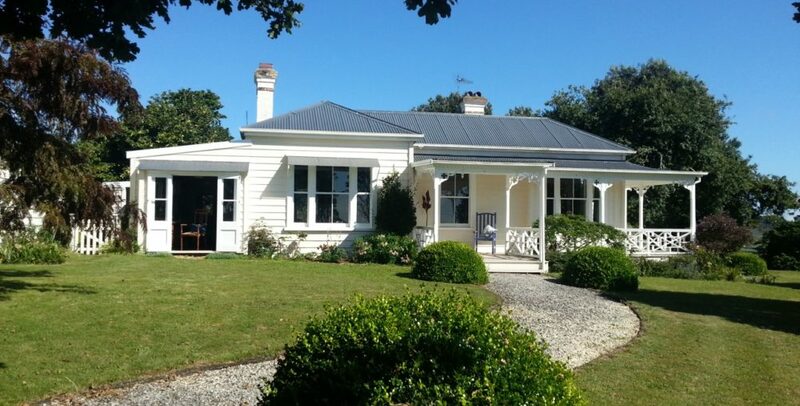 While the property is located in a small rural village you are only 45 minutes drive from Auckland International airport, (55 minutes from Auckland city, and 14 minutes from State Highway 1). You stay in the calm and beautifully appointed surroundings of the extensive 60 square metres, sun filled Kaipo suite, with views over the garden and surrounding farmland. This accommodation comprises the very large master bedroom with ensuite, and a private dining room, both these open to the verandahs with direct access to the garden. At Miller House your booking ensures privacy. A second (queen) West Verandah bedroom, adjacent to the suite, can be made available to your additional guests, if required. This room also opens through french doors on to the verandah. The house dates back to 1895 when James Miller bought 100 acres in the centre of Onewhero village. The property has over 5 hectares (12 acres) of grounds and guests can enjoy walking in the gardens, or wandering through the 1.5 hectares of mature native bush with its spring fed stream, native pigeons, Pukekos, Tuis and range of beautiful ancient trees. Croquet and Petanque can be set up on the old tennis court for those wishing to just soak up the atmosphere, or there is a large range of local attractions and activities, good bike rides, surfing at Port Waikato, caving at Nikau Caves, motorsport at Pukekohe just to mention just a few. More of the local and regional attractions easily accessible from Miller House are listed on the Local Attractions page. The property has beef cattle, frizzle bantams, Ned the farm dog, pheasants and the usual measure of rabbits, for which Baz the cat is employed, (he “works cheap” and he won’t bother you, so your total privacy is assured). Bird song, and elegant calm all within easy reach of your next destination. Copyright © 2019 Miller House .